in architecture, the member of an entablature between the architrave and the cornice or any horizontal band used for decorative purposes. In the first type the Doric frieze alternates the metope and the triglyph; that of the other orders is plain or sculptured. The 5th-century B.C. treasury of the Cnidians at Delphi shows figures in the frieze. 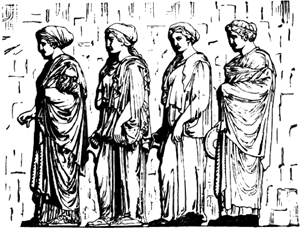 Roman and Renaissance examples, a notable one being on the 1st-century B.C. temple of Vesta at Tivoli, display acanthus leaves and other ornamentation. An elevated horizontal continuous band or panel that is usually located below the cornice, and often decorated with sculpture in low relief. A decorated band immediately below the cornice on an interior wall. Thick, heavyweight coating and upholstery fabric, with a rough, raised fibrous surface and a more or less hard feel. 1. 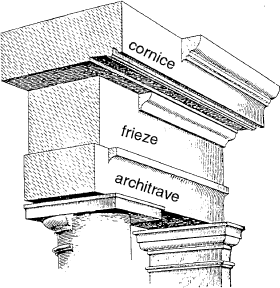 In Classical architecture and derivatives, the middle horizontal member of three main divisions of an entablature, above the architrave and below the cornice. 2. A decorative band at or near the top of an interior wall below the cornice. 3. In house construction, a horizontal member connecting the top row of the siding with the underside of the cornice. Also see cushion frieze. a heavy woollen fabric with a long nap, used for coats, etc. You can turn the leaves like a traditional book, use it flat like a frieze, set it up as a star or revolve it in a circle. Both the FIAC and Frieze Week results improved vastly on those of last year. As for the experience of participating in the fair, which brings together the world's leading galleries and showcases the work of today's most significant contemporary artists, Naim said: "It's really nice to be part of Frieze because you get a lot of feedback in a very short space of time. The frieze is more than two hundred feet long and has never been viewed in its entirety by the public or by the artist herself. The Collections Fund at Frieze is designed to support the acquisition of significant contemporary works for CAS museum members across the UK, bringing together the knowledge and experience of private collectors with that of public sector curators. Last year, a 6ft frieze of Elvis Presley helped to raise almost PS3,000 for Marie Curie Cancer Care and this year David is hoping to raise even more. Matranga's films will complement Frieze London's new "Live" section dedicated to performance and interactive works; the emerging "Focus" gallery section; and Lees's Frieze Projects program, in which artists create performative commissions (Nick Mauss will stage a new ballet each day, for example). The plaster frieze, created by the designer of the Royal Artillery Memorial in London's Hyde Park Corner - widely regarded as one of the nation's finest war memorials - was shown at the recent launch of The Hepworth Wakefield's new fund-raising campaign, I'm Yours. The frieze dates back more than 1,400 years to a time when the Maya flourished. Washington, Aug 09 ( ANI ): The Guatemalan government has revealed that archaeologists have found an "extraordinary" Mayan frieze which is richly decorated with images of deities and rulers and a long dedicatory inscription. The annual visit to the Frieze Art Fair, a vast showcase for contemporary art in a great marquee in Regent's Park, is generally something of a nightmare.